A very enthusiastic and friendly Wilderness Explorer, dressed just like Russell from the movie UP, invited us over to join the adventure. 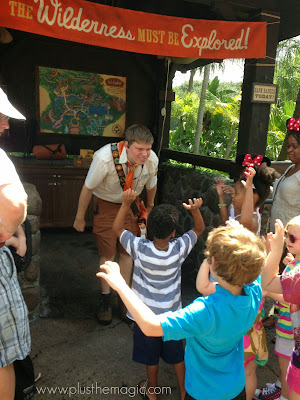 He was handing out Wilderness Explorer Handbooks to every kid who wanted to participate. 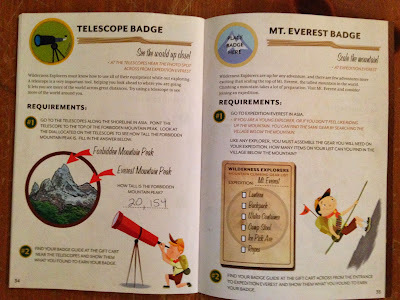 Each handbook contained a map, as well as pages for 30 different Badges to earn. There are Explorer Stations set up all around the park where families can stop and earn the badges by speaking to a naturalist, doing some hands on activities, observing animals, and learning things about the animals and places found around the Animal Kingdom. To be honest, I was more than a little hesitant. Our vacation included only one day at Animal Kingdom and I had a mission: beat the crowds while making a beeline to Expedition Everest, stopping at Dinosaur of course, with Kali River Rapids towards the end of the day, squeezing it all in around our lunch reservation at Tusker House….we had to find DeVine, stop at a Bugs Life, do some pin trading, see some animals….well, you get the point. We had a lot to do and not enough time. 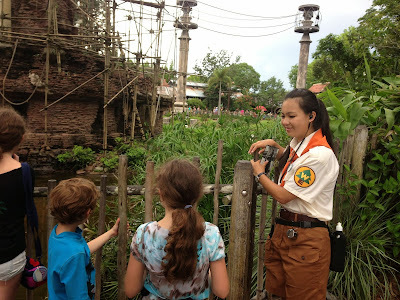 So, my first impulse was to think that the Wilderness Explorers experience might derail my timetable and would not be worth the time and effort considering our short stay. I WAS WRONG. Very, very, wrong. If you have children of any age, YOU SHOULD DEFINITELY DO THIS! The program is absolutely amazing. It is very well thought out, and has aspects that appeal to all ages and interests. The littlest kids are very much excited about the handbook and earning the badges, and checking off each stop along the way is a big thrill. This was absolutely perfect for my 7 year old. Older kids may find the handbook a little too “young” for them, but that doesn’t mean they won’t be interested in the wilderness stations. They can participate and listen and learn even if they are too cool for the handbook. My 10 year old declined the handbook at first but wound up captivated by the program and we went back to get a handbook halfway through the day. I found the naturalists to be very well educated and informed and they were willing to answer questions at any level. My 12 year old, probably on the outer edge of the age range this program is geared to, tagged along and “assisted” her siblings with the badge requirements, interacting with the naturalists and learning some new things along the way as well. The badges in the book can be completed in any order, which is a huge plus. Some of the experiences at other parks require you to go to certain places in a particular order, which can take you off track if you have a plan for the day already in mind. Here, you can stop at any badge station which happens to be on the way to wherever you were already headed -there are stations all over the park. There were badges on a wide variety of subjects. Whether your kids are into animals, insects, conservation, hiking, dinosaurs, or culture, there are plenty of badges that will interest them. There is no pressure at all to complete all 30 badges – you can do as many or as few as will conveniently fit into your day. Of course there is usually one child who is hyper-focused on completing ALL the badges, but the program handles this problem nicely. 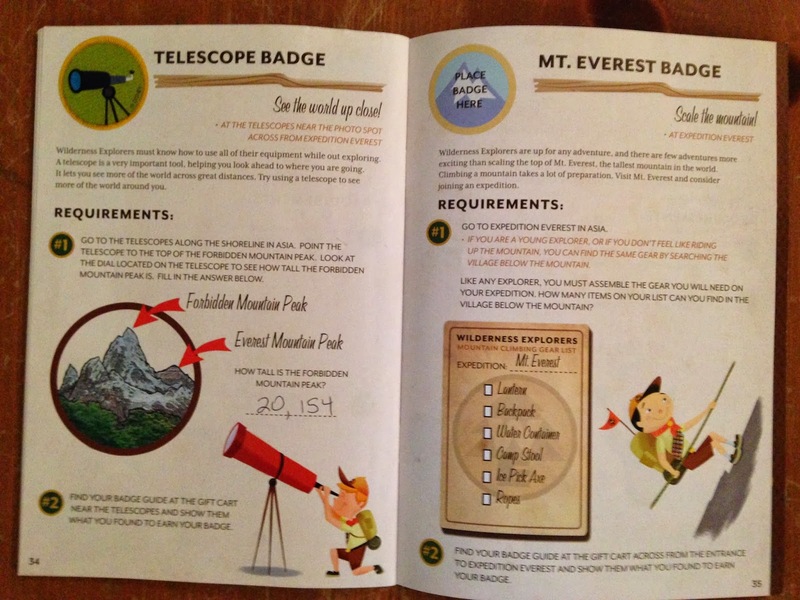 Explorers can earn “Explorer Rankings” for completing as few as 5 badges, and the handbook specifically encourages explorers to bring back the book on their next trip –whenever that may be – to continue earning badges. At the stop below, Explorers learned about how animals communicate. Another stop nearby explained how currency is different all over the world, and the Explorers learned about currency conversion rates – in a very fun way. Another stop, pictured below, was my favorite. We learned a lot about the siamang apes who live in this area near the Kali River Rapids. My children were fascinated and spent an extraordinary amount of time with this naturalist, using her binoculars to observe the apes, and asking lots of great questions. It was incredibly satisfying for me to watch this, and to know that even in the midst of the craziness of one of the busiest theme parks on earth, their minds were being opened and inspired, and they were no longer in a rush to get to the next big thing. Amazingly, their attention spans seemed to stretch before my eyes! The Wilderness Explorers program added tremendously to the overall experience at this park. It is a wonderful counterbalance to the general level of technology and stimulation found on any Disney vacation. The stations provided a way for my tired, revved-up kids to take a breather, stimulate their brains, learn something, and still have fun. Since the stations are generally off to the side of the path, and not crowded, the whole family had a chance to stop, touch, feel, and interact - all while resting our over-stimulated senses. At the end of the day I felt humbled that I considered passing this up in my rush to get to the next ride. 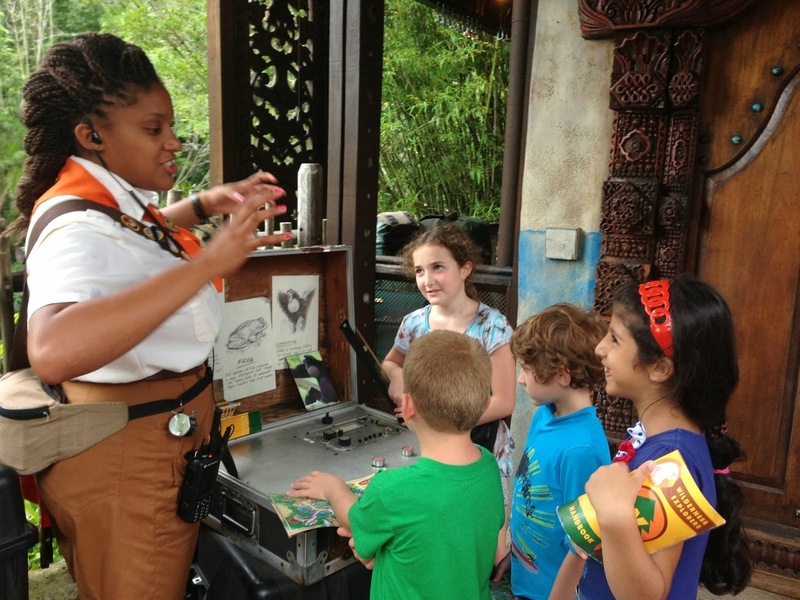 Wilderness Explorers is definitely a must-do!